This Community will seek to provide support and resources to those in the Alliance that encounter, work with, or have a passion for the homeless in our neighborhoods. We will work with groups inside and outside our Alliance who are committed to developing and implementing strategies to prevent and end homelessness. 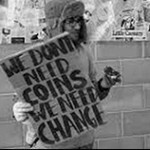 We will promote health, hope, and dignity for the homeless and underserved with whom we engage. We will honor, support, and build the various gifts and callings that arise from our Alliance to respond to the needs of these, seeking every means available to offer the cup of cold water. We recognize the overlap of passion and heart with other Alliance communities including: COMMUNITY TO END HUNGER; COMMUNITY FOR THOSE WHO STRUGGLE WITH MENTAL ILLNESS AND THEIR FAMILIES; PEACE & JUSTICE COMMUNITY; COMMUNITY OF RECONCILIATION WITH OFFENDERS. We will support each other as possible as we commit to finding ways to serve these whom God loves so dearly. Contact Mary Bradley.